Kit Includes: 2 Black ProClick spines, 2 Clear View front covers, 2 Black back covers, and 50 sheets of pre-punched paper. 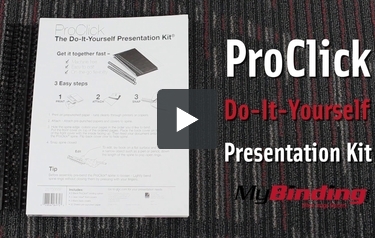 MyBinding is proud to offer the GBC ProClick Do-It-Yourself Presentation Kit to make your life simpler and easier. This kit is an all-in-one do-it-yourself style kit that comes complete with 50 pages of 8.5" x 11" ProClick prepunched paper, 2 Black 5/16" ProClick binding spines, 2 Black binding back covers, and 2 Clear View front binding covers. This kit works perfect for home users, small offices, or even schools as you don't need a binding machine to punch and bind the pages; you simply need to print your document on the prepunched pages, and bind it yourself with this do-it-yourself kit. Put together the perfect presentation with ease today using GBC Proclick binding supplies and covers. I was in a hurry to make a portfolio for my new catering business. This worked really well and turned out very professional. I actually ordered another set to make extras! Loved it!! I like this package - everything you need to make a professional booklet is here. Only con for me is - I had to order more prepunched paper because there wasn't't enough provided. Transcript: Welcome to MyBinding.com. This is the ProClick Do-It-Yourself Presentation Kit. Everything you need for a professional booklet. This kit includes two Clean View Covers, two black back covers, two ProClick binding spines, and fifty sheets of pre-punched paper. Start by printing on your pre-punched paper, then align your pages and covers. A tip to hide the spine seam is to place the back cover on top, then flip it over. Take your ProClick binding spine, feed it through the holes and click the rings together. Welcome to MyBinding.com. This is the ProClick Do-It-Yourself Presentation Kit. Everything you need for a professional booklet. For quicker assembly and easy editing, use the ProClick Zipper Editing Tool. Slip the long nose inside the rings and pull it along the spine, make your edit, then fit the wide end around the spine and pull back down to seal. Print your document on the pre-punched paper. Your document can be up to 100 pages long, despite on the diameter of the Pro-Click spine. Put your book together, including the covers. If you want to hide the opening of the spine, place the document’s back cover on top of the front cover. The reverse side of the back cover should be facing you. Insert the teeth of the Pro-Click spine into the holes in your document. Click the spine closed with your fingers. Rotate the back cover to hide the spine’s opening. Your document should look great. If you need to re-open the spine later on, separate the teeth with a pen. Add or subject pages as necessary and close the spine again. As you can see, it’s easy to use one of these presentation kits. It’s also quick, so you will be able to meet your deadline without any problems. Best of all, you don’t need any special equipment, so you can even bind documents when you’re not in the office. Good luck! Looking for size 8 1/2 X 11 inch, 26-hole pre-punched paper... to place into my ring school binder. Why is this so impossible to find for letter sized paper? Don't want a hole-puncher. Don't want smaller paper size. Thank you for your question. Unfortunately we do not have a pre-punched paper that would match a 26 hole pattern for prepunched pattern.None of the standard commercial binding options punch a 26 hole pattern on the 11" side of the sheet, it sounds like the pattern you are trying to match is a proprietary pattern that isn't commercially available.